This is in many ways a break with tradition. Normally Toshiya Tsunoda writes detailed descriptions of what he does per piece, but in this case it is just said he reworks an old cassette by Kapotte Muziek, called '4 stukken'. This is the second break: up until now musicians involved in this series used live recordings, but Tsunoda is the first to use a studio recording by Kapotte Muziek. Like the cassette there are four parts, corresponding with the original release and they are reworked in the best Tsunoda tradition, involving field recordings and strange and unusual on-site recordings. The sound work of Japanese artist Toshiya Tsunoda represents a radical rethinking of the concept of field recordings. Rather than being documental or naturalistic, his pieces appear as unique music compositions concerned with the relation between space and cognition, rendering the vibration of objects audible, revealing the hidden beauty in each sonic detail. With the meticulously scientific approach of a cataloguist, Tsunoda captures the depth of the landscape, the vital breathing of things. Toshiya Tsunoda is a Yokohama, Japan based artist who studied at the Tokyo National University of Fine Art and Music. Since 1994, he has been operating the WrK label, which he co-founded with Minoru Sato. He has released work on Staalplaat (NL), Selektion (DE) and Hapna (SW). His work has been shown at the ICC, Tokyo, and the Kawasaki city museum, among others. Japanese field recording specialist Toshiya Tsunoda is the latest composer to receive an invitation to rework the sounds of Kapotte Muziek, one of the many ongoing projects for the ever prolific Frans de Waard. Through Kapotte Muziek, De Waard has presented a dynamic form of electroacoustic techniques in recycling sounds from discarded objects, second hand music and other forms of cultural detritus. This, the Kapotte Muziek By... series is a logical extension of De Waard's own recycling programme, in handing over his own recordings to selected composers for them to reinterpret. By all appearances, Tsunoda took the Kapotte Muziek cassette Vier Stukken to Nagaura Bay in Yokosuko City, Japan and played back the Kapotte Muziek sounds within that environment. Yet Tsunoda's strategies in the placement of the microphone within a bottle or the cassette player against a resonating metal plate thoroughly irradiate both the environmental sounds and the Kapotte Muziek tracks to arrive at a blustery abstraction of crackle, hiss and vibration. 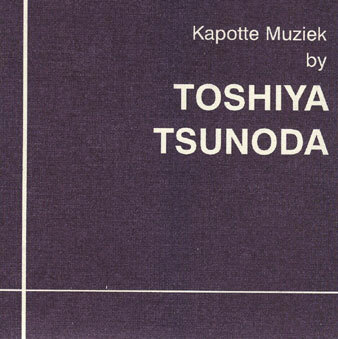 Kapotte Muziek by TOSHIYA TSUNODA (KP 3014) ist die 11. Folge dieser von Frans de Waard initiierten Reihe. Der Japaner hat dafür Material überarbeitet, das 1992 auf der KP-Kassette Vier Stukken erschienen ist. Wie immer das vorher geklungen haben mag, jetzt hört man ein rieselndes Knirschen, das durch die lappende Brandung am Nagaura-Strand bei Yokosuka City, aufgenommen am 24.12.2003, überlagert wird. Wenn man den Böttger-Effekt abzieht, könnte der japanische Environmentalakustiker, der mir durch sein ful-Duo mit seinem WrK-Labelpartner Minoru Sato auf Selektion bekannt geworden ist, aber auch in seiner Badewanne mit Gummientchen geplätschert haben. Drei weitere Versionen variieren diesen Ansatz einer akustischen Doppelbelichtung oder Übermalung. Auffällig ist der strenge No-Nonsense-Minimalismus, der Fieldrecordings von Wasser, von Vögeln, mit rauhem Gedröhn, das sich wie eine stehende Welle darüber legt, bruitistisch entidyllisiert. Mir ist bis heute nicht klar, ob die so genannte Noise Culture im Lärm einen Aggressor umarmt und dadurch halbwegs neutralisiert, so dass man aufmerksam seiner unerhörten Schönheit lauscht, ob sie erste und zweite Natur zu versöhnen oder lediglich den romantischen Kalbsblick auf die 'Natur' zu düpieren versucht. Wahrscheinlich versperre ich mir aber mit meinen unsinnlichen Warums gerade den Zugang zu dem, was einfach 'ist'. Plus ascétique, le monde musical de Toshiya Tsunoda est une célébration des mircosons. Crépitements, drones infra, fantômes de manipulations concrètes et fuite de gaz réfrigérant constituent le matérial nécessaire à l'élaboration carbonée de sa musique. Excitant l'imagination saus d'autre rappel précis qa'aux sources utilisées, sa participation aux réinterprétations de Kapotte Muziek (série Kapotte Muziek by, sur Korm Plastics/Naninani) confirme un talent discret mais essentiel, où chimie et poésie se mêlent, articulant les sons les plus infimes.